Finance Minister Bill Morneau has quietly reversed a controversial decision to slap a surtax on*two types of Mexican steel imports. Effective Feb. 2, Mexican energy tubular products (such as those used to build pipelines) and wire rod shipments*will no longer cost an extra 25 per cent under*Canada's emergency 'safeguard' measures. For Mexico alone, new tariff-free thresholds have*been set for the 200-day period to which*the temporary surtax applies. The*72,820-tonne*quota for tubular products*and the 16,776-tonne quota for wire rod*are*based on an*average volume of Mexican imports in recent years, plus a bit of growth, according to Morneau's office. Surtax*already paid by purchasers will be refunded. "We made those changes in recognition of Canada and Mexico's mutual rights and obligations under NAFTA," Morneau's spokesperson Pierre-Olivier Herbert told CBC News this week. 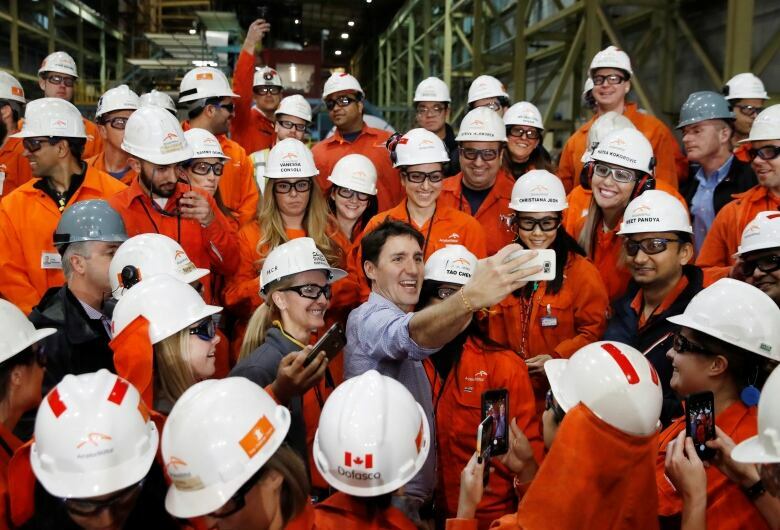 The safeguards, he said, meet the government's goal of "protecting steel producers from a harmful surge of imports and minimizing trade disruptions for Canadian businesses." Canada's emergency safeguard measures on seven categories of steel imports*(just two of them from Mexico) began last October. They were introduced to prevent dumping of steel in Canadian markets in the wake of the United States' decision to impose 25 per cent tariffs on steel imports. Mexico*strongly objected to being lumped in with other countries, accused Canada of being unfairly protectionist*and threatened to retaliate against Canada — possibly by bringing a case before*the World Trade Organization (WTO). The dispute further strained*an already-tense*Canada–Mexico relationship in the final weeks leading up to the signing of the revised North American trade agreement*on Nov. 30. Canada's surtax*suggested Mexican*steel is unfairly traded, just as Mexico was struggling to prove the opposite to the Americans. Mexican said the two taxed products represented 20 per cent of Mexico's global steel exports. The decision to target tubular products also*worried Canada's energy sector. Already*dealing with low commodity prices and layoffs, the energy industry*now faced an extra tax on its production inputs as well. Negotiations that weren't publicized in the media led to the*signing of a memorandum of understanding (MOU) between Canada and Mexico*on Jan.16. Mexico also agreed to "immediately attend to any backlog of Canadian steel exports at the Mexican border" and ensure that Canadian exports are not unduly delayed*— another way Mexico could have retaliated. Hearings testing*the evidence for and against the emergency safeguards were held at the Canadian International Trade Tribunal (CITT) last month. Domestic steel producers tried*to prove the extra safeguards were protecting their businesses from unfairly-traded cheap foreign steel, while manufacturers and other importers*argued the surtaxes*had inflated their input costs, putting*jobs and entire businesses at risk. At the conclusion of a*200-day period that started in October,*Morneau*must decide whether to continue the surtax. The tribunal will make its recommendations*later this spring. The CITT*asked for an extra*$2.1 million beyond*its usual budget*to conduct this*inquiry, which lasted Jan. 7-24*and produced stacks of submissions. As arguments before the CITT began*on energy tubular products, the Canada–Mexico*MOU had not been disclosed. *Some of the interested parties*learned*Mexico cut a deal only after the hearings*concluded. Tenaris, a*company that imports steel products from its Mexican production facilities into Canada,*laid off an additional 95 Canadian employees at its Sault Ste. Marie, Ont. facility on Jan. 25. However, it's not clear there's a direct relationship between its Mexican business and this decision to cut its Canadian workforce. "The Trudeau government is out there saying ... this is all about protecting Canadian steel jobs," said Cyndee Todgham Cherniak, a trade lawyer for other clients participating in the safeguards inquiry. "What you've got in the meantime is the energy sector in Alberta having to pay more for Canadian steel, and not being in a position to afford it at this point in time. It's causing layoffs in the manufacturing sector because they can't afford the higher price." In some cases, it's now*cheaper to import final products from China*— even as Chinese imports face tariffs — than to manufacture them in a North American supply chain so burdened*with*tariffs and surtaxes, she said. "When you strip it away, it's about collecting additional revenue at the border on steel that's needed by Canadians, and passing that cost on to the Canadian consumer and businesses," she said. Lucrative for government, but risky? CBC News has asked the Finance Department several times how much revenue the steel safeguards raised for Canada's treasury since October. No figures have been released. Finance has disclosed how much it collected in retaliatory tariffs on U.S. imports: $839 million in the first six months*leading up to Dec.31. For its part, the U.S. treasury collected over US$931 million in duties on Canadian steel imports between June and October alone. Earlier this month, the U.S. International Trade Commission (ITC) instigated an anti-dumping and countervailing duty*investigation of*fabricated structural steel components from Canada, China and Mexico. Canada previously launched a similar investigation of fabricated*steel from other countries, and that appears to have drawn the American industry's*attention, Todgham Cherniak said. In today's trade climate, it's not clear that Canada will be able to separate itself from China and Mexico in the Trump administration's eyes. The U.S. ITC*investigation will compare*the price Canadian companies charge U.S. customers to what it costs to produce these steel components (which could be *more now, thanks to this extra taxation on steel inputs) and judge*whether such prices are fair. But the pricing in*U.S. sales contracts could predate the*tariffs*and surtaxes that started*in the second half of 2018. "We are in an age where the finding of injury in anti-dumping cases involving steel is quite common," Todgham Cherniak*said. *"Are [American] steel producers bringing cases because they know they can? Probably." The five years of protection*a U.S. producer could get from winning a*dumping case could outlast the Trump administration's "national security" tariffs, which are being challenged in*WTO arbitration by several countries. Some U.S. lawmakers also are*refusing to vote to ratify*the new NAFTA*if these steel tariffs remain in place.